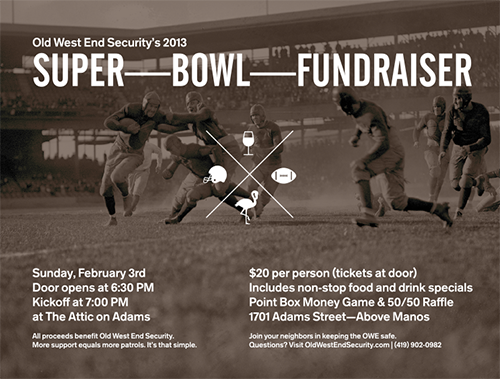 Old West End Security hosted their 2nd Super Bowl party at The Attic on Adams earlier this month. D. and I joined our neighbors in the fun, non-stop game day snacks and yummy drinks. I’m not much into football but thought it was very cool that the coaches from both teams are brothers, and from Toledo! The half-time show was pretty epic, no? A good night was had by all, and all proceeds benefited Old West End Security’s efforts to keep my favorite neighborhood’s streets well-patrolled. A huge thanks goes out to Amelia and everyone at The Attic for making sure everyone was well-fed and provided great cocktails!